Dasher is a drop from a new rare elite in Patch 8.1. Deals 197 Beast damage and causes the target to Bleed for 98 Beast damage per round for 5 rounds. Attacks wildly, dealing 344.75 to 640.25 Flying damage and entering a frenzy for 1 round. While frenzied, damage dealt is increased by 50% and the user takes damage as if they were a Flying pet. Just got this guy on a alt of mine can conform he spawns under the bridge and both factions can loot. He definitely dropped for each party member the first time around. Waited for the re-set after Tuesday and next time we saw him, one of us was on a different character and he only dropped for the new character so thinking this is a 100% drop rate but only ONE TIME for EACH CHARACTER. We've roatated this out a few times now and that seems to be the case but since they're account wide we've each gotten two now by swapping characters. Can confirm he ALWAYS spawns by the bridge. Happy hunting! Can confirm N'chala spawn location as given by coords in previous comment. Was standing under the bridge with /tar macro whilst in queue and he popped to my right towards the grounds, very close to the regular green raptor you see walking. His direction was immediately walking pace towards me under the rope-bridge. Got him at 21:20 PM, Saurfang. At 69.59,36.80, saw him walking under the bridge. N'achala The Egg Thief spawned for me in the Feeding Grounds at 1:00am EST (10:00pm PST) on Moon Guard. Pet seems to be 100% drop, but you can only loot the pet one time. 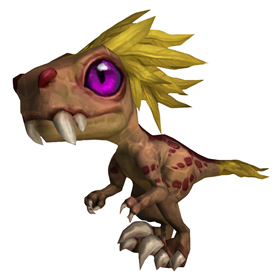 Mob is about 100m north of the new Baby Zandalari Raptors in The Feeding Grounds. If you're looking for the new pet, you'll likely see this guy on radar if he's up. Not sure on drop chance, got him first try. Pops in Journal as an Uncommon (green) not Rare (blue). Like many other species, you can get a rough guess of how large the raptor will be as a fully grown adult by the size of its largest claw.